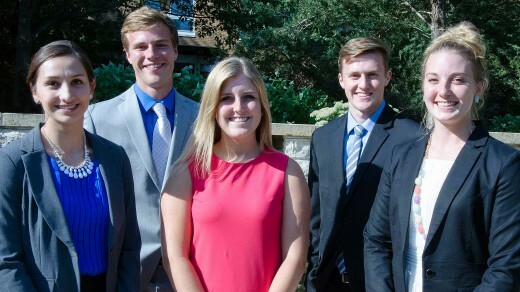 The newly elected 2015-2016 Upper Iowa University Student Government Association officers are (l-r) treasurer Taylor Williams, president Aaron Calkins, secretary Madison Wilkin, academic extension officer Ty Johnson, vice president Sydney Cyzon. A transfer student from Fond du Lac, Wis., has been elected the 2015-2016 Upper Iowa University Student Government Association (SGA) president. Aaron Calkins, a junior business administration major, previously served as class president at Clarke University in Dubuque. “Upper Iowa is known for its global campus, so I knew the student government here could help create new ideas that would make a positive impact on the entire University and beyond,” said Calkins, while explaining why he ran for student government president. Vice president Sydney Cyzon, a senior biology major from De Pere, Wis.
Treasurer Taylor Williams, a senior mathematics, financial management and accounting major from New London, Wis.
Secretary Madison (Madie) Wilkin, a senior mathematics and financial management major from Center Point, Iowa. Academic extension officer Ty Johnson, a junior finance and marketing major from Chaska, Minn.
Johnson noted that each of the officers want to develop SGA into a destination for students to get more involved in making a difference at UIU. As an example, Cyzon reported among the potential projects is the formation of a UIU news broadcast that could eventually update the University community on what the Peacock family is doing around the world. SGA public meetings are scheduled for Wednesdays, Oct. 7, Oct. 28, Nov. 18, Dec. 9, Jan. 20, Feb. 3, Feb. 17, March 16, March 30, April 13, April 27. All public meetings are held from 12:15 – 12:45 p.m. in the UIU Student Center Ballroom on the Fayette Campus. Agendas and any scheduling changes are emailed to students. For additional information, contact studentgovernment@uiu.edu.